This circuit can be used to test whether mains voltage is present or not without having electric contact with mains line. The CMOS IC CD4033 is the heart of this circuit. 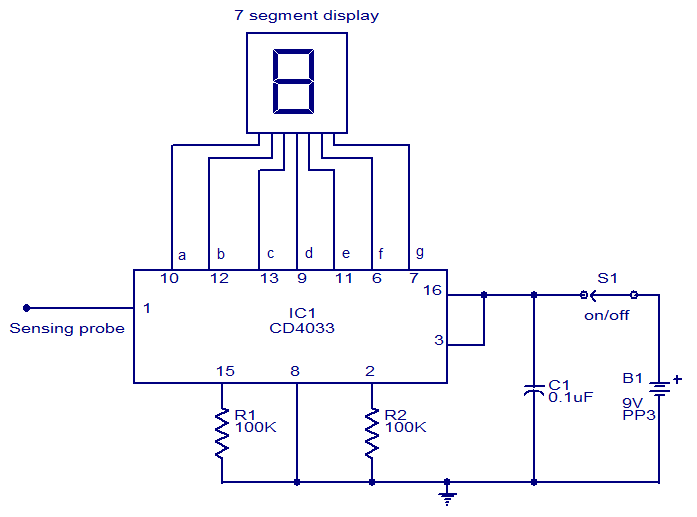 The CD4033 consists of a 5 stage decade Johnson counter and an output decoder for converting the Johnson code to a 7 segment decoded output for driving 7 segment LED display. A 10cm long insulated copper wire connected to the clock pin (pin1) of the IC serves as the sensor. The sensor wire has to be placed in the vicinity of the mains wire to be tested. When there is no voltage in the mains line, no voltage will be induced in the sensor wire and the display will show a random digit. When there is voltage in the mains line, a small voltage will be induced in the sensor wire due to electromagnetic induction and this voltage is sufficient enough to clock the CMOS IC CD4033. Now the display will count from zero to nine and repeat. Use 9V PP3 battery for powering the circuit. Use a 10cm insulated wire as the sensor. The IC must be mounted on a holder. Switch S1 can be a miniature ON/OFF switch. Is there any equivalent for IC CD4033 for this circuit ?? Coz i didn’t find any around my city . Plz answer thanks ! this ckt is really works… thanx for the ckt…thats my mini project.. The mains voltage tester is a nice circuit to test the voltage. These type of Circuits are kind of foundation for the modern Testing Tools like Smart Tweezers. Thanks, it works, it’s beautiful! But more than count from 1 to 9 and to repeat, it seems that trembles, because the count is too fast. It looks more like a vibration that counts. If you can slow down this count, how to do? Thanks again, Toni Ipnos. please help me… i had made the same ckt about which u tell bt led continuously glowing… it does nt sense mains voltage..tell me what to do..? which type of probes should be installed??? The 7 segment display will blink continously. So you can use this only for voltage indication purposes. Be Careful Folks when using this,,,,,,Safety Always FIRST!! Nice Circuit Never The Less!!!! Hi Suyog you have to use common cathode display, cathode being connected to -ve common. hello sir, i purchased this equipment. I connected correctly but not working. It shows all segments are blinking but not induced any voltage when placed nearer to tested wire. Please tell me the solution sir. Hi Chethan Babu.s 0.1 Âµf is ceramic disc type capacitor.9V PP3 Battry will work.You Must Use 7 Segment Common Cathode Type Display.Pin 3 or 8 connected to ground respictly.I made and it still work.Display fast count 1 to 9.You can see that all displays are blinking because they change at 50 Hz.